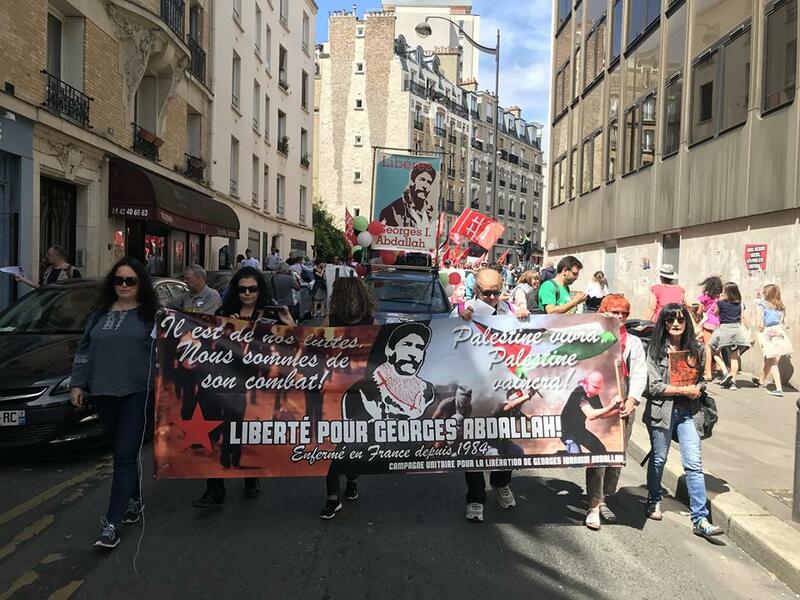 On 23 June, activists in Paris marched to demand the liberation of Georges Ibrahim Abdallah, the Lebanese Communist struggler for Palestine imprisoned in France for over 33 years. 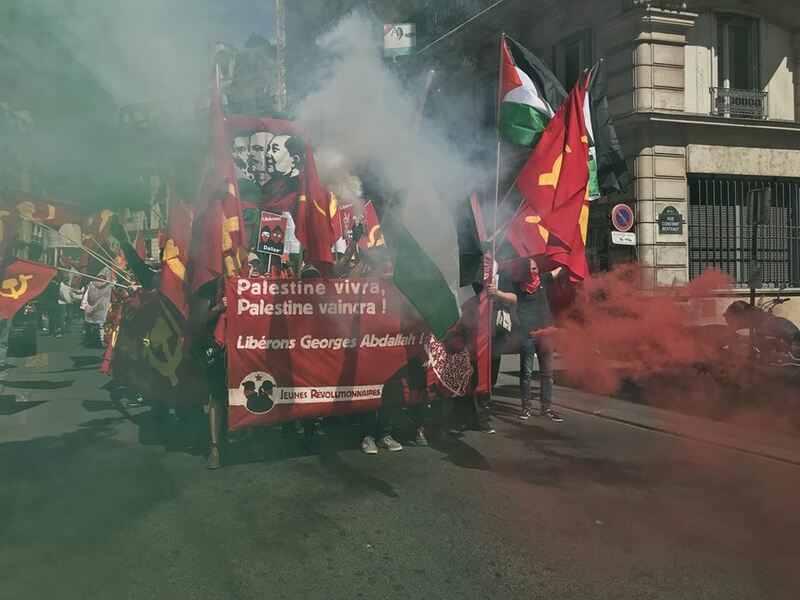 Organized by the Unified Campaign to Free Georges Abdallah, a number of organizations, including the Campagne BDS France, Secours Rouge, Plate-forme Charleroi-Palestine, Secours Rouge, Jeunes Revolutionnaires, CAPJPO-EuroPalestine, Parti Communiste Maoiste and many others, joined the march through the streets of Paris. 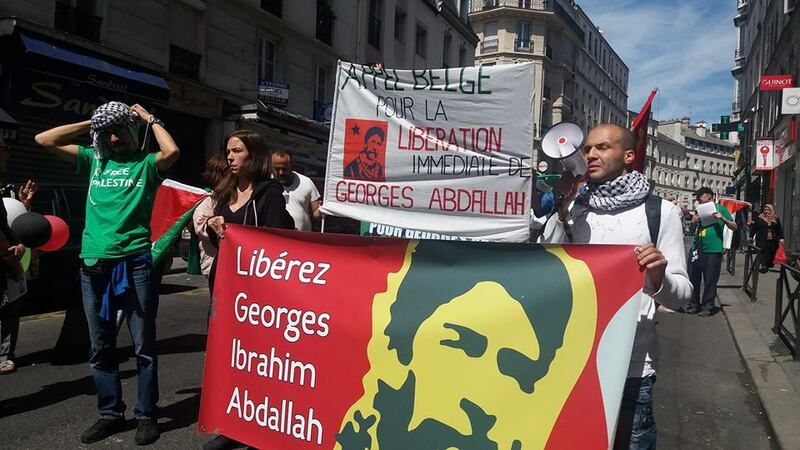 A group from Belgium, organized by Plate-form Charleroi-Palestine and the Belgian Appeal for the Freedom of Georges Abdallah, also travelled to attend the protest. The event included a special presentation of a letter by Georges Abdallah from Lannemezan Prison to those struggling for his freedom in the demonstration. 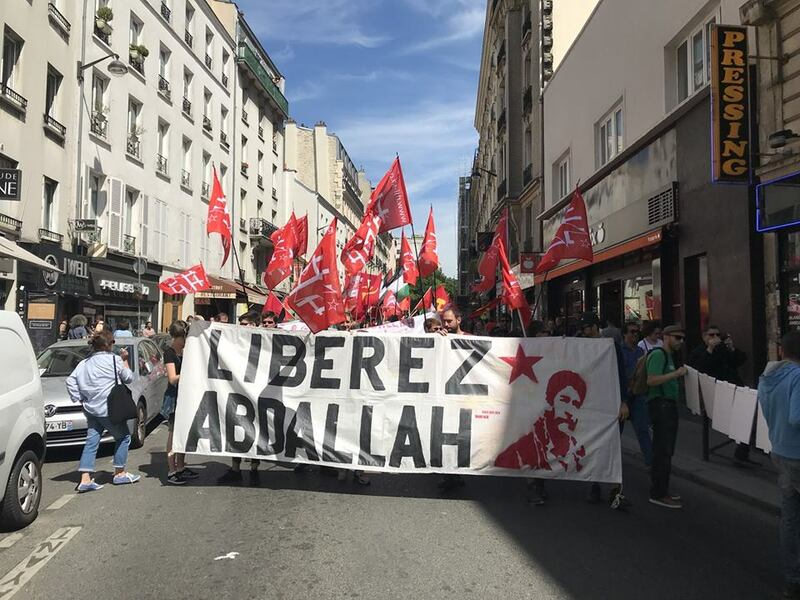 In this time of great struggles, Comrades, your gathering today in Paris fills me by strength, warms my heart and especially strengthens me in the conviction that it is only by assuming more and more the ground of the anti-capitalist and anti-imperialist struggle that we bring the most powerful support to those who have resisted for decades behind these abominable walls. Of course Comrades, it is not good intentions that are missing. In spite of all the suffering of lengthy captivity, there is not and there will be no possibility of escaping what is needed – the effort necessary to change the balance of power, if one longs for (as say some of my relatives) the release of our comrades. Let’s develop solidarity by always assuming the ground of the anti-capitalist and anti-imperialist struggle and “our old friend …” this “old mole who knows underground work so well” will not be indifferent to our efforts. This is precisely why, Comrades, it is of paramount importance to know and to be able to make clear this approach to solidarity in the global dynamics of the ongoing struggles. The crisis of moribund capitalism in its phase of advanced putrefaction is already there before our eyes at the global level, in the centers of the system as in its peripheries … What is happening these days in the Arab world in general, and in Palestine in particular (Yemen, Bahrain, Syria and Libya too …), is more than emblematic in this respect. Imperialist forces of all stripes are engaged in a multi-dimensional war, reflecting inter-imperialist contradictions on the one hand and an imperialist war of looting and destruction on the other. The majority of the Arab bourgeoisie has opted for this camp … on the other hand, Palestine on a daily basis gives us all the lessons of sacrifice and courage of exceptional scope. More than ever, the Palestinian popular masses, in spite of all the treachery of the bourgeoisie, assume their role as the true guarantor of the defense of the interests of the people. Young and old martyrs fall by the hundreds, even as they march unarmed. Yet the imperialists of all kinds do not take offense at their friend Bibi, the distinguished guest of the Elysee. Palestine remains nonetheless, despite the treachery of the bourgeoisie or not, despite direct or indirect imperialist interventions. The Resistance continues and certainly it will continue as long as the occupation continues. Naturally, the Palestinian popular masses and their fighting vanguard in captivity must rely more than ever on your active solidarity. May a thousand solidarity initiatives flourish in support of Palestine and its promising Resistance. Solidarity, all solidarity with the Resistance in Zionist jails, and in isolation cells in Morocco, Turkey, Greece, the Philippines and elsewhere in the world! Solidarity, all solidarity with the young proletarians of the working class neighborhoods! Solidarity, all solidarity with the railway workers and other proletarians in struggle! Honor to the Martyrs and the popular masses in struggle! Down with imperialism and its Zionist watchdogs and other Arab reactionaries! Capitalism is nothing but barbarism, honor to all those who oppose it in the diversity of their expressions! Together Comrades, and only together will we win! To all of you Comrades and friends, my warmest revolutionary greetings. This entry was posted in Knastkämpfe, RHI and tagged Georges Ibrahim Abdallah, Palästina, Paris, RHI, Solidarität on 2018/06/28 by Rote Hilfe Schweiz. This entry was posted in Knastkämpfe, RHI and tagged Ahmet Düzgün Yüksel, Andreas Krebs, Griechenland, Marco Camenisch, Olli Rast, RHI on 2014/07/16 by Rote Hilfe Schweiz. Konkret will die Regierung eine Neuklassifizierung der Gefangenen in drei Typen durchbringen: Typ A, das sind die Reichen, die wegen Vermögensdelikten usw. einsitzen. Typ B sind viele Gefangene, die wegen kleinerer Delikte einsitzen. Und Typ C sind schliesslich die revolutionären, politischen und rebellischen Gefangenen des bewaffneten Kampfes, mitunter auch die, die sich im Knast gegen Missstände auflehnen und protestieren. Je nach Gefangenen-Typ droht ein anders Gefangenen-Regime. Den Gefangenen des Typ C droht Isolationshaft, die Streichung von Hafturlauben und Besuchen. Kommt der Vorschlag der Regierung durch, dann drohen diesen Gefangenen Bedingungen wie in den F-Typ Gefängnissen der Türkei, den Hochsicherheitsknästen Deutschlands und dem FIES-Regime in Spanien. Die Regierung hat die Vorlage jetzt, kurz vor den Sommerferien, in Griechenland eingebracht. Zu einem Zeitpunkt, wo eine gesellschaftliche Debatte nur schwer möglich ist. Im Parlament soll der Vorschlag bis zum 10 Juli angenommen werden – entgegen der üblichen Praxis, dass das Parlament im Sommer keine Gesetze annimmt. Die politischen Gefangenen (darunter solche des 17. November, des Revolutionären Kampf, der Verschwörung der Feuerzellen) nehmen vom 18. bis zum 20. Juni das Essen der Knäste nicht an, danach wird ein Hungerstreik diskutiert. Auch die anderen Gefangenen werden sich mit dem Gesetzesentwurf auseinandersetzen, da er auch ihre Situation verschlechtern wird. Die Solidaritätsbewegung ausserhalb der Knäste ruft unter anderem zu Demonstrationen und Aktionen in Athen, Thessaloniki und anderen Städten in Griechenland. Es ist unmittelbar jetzt wichtig, dass praktische, internationale Solidarität ausgeübt wird. Wir rufen dazu auf, die Gefangenen und die Solidaritätsbewegung in Griechenland zu unterstützen. Schickt Berichte, Fotos & sonstiges an info(ät)rhi-sri(dot)org, damit es die Militanten vor Ort erreicht. Die Folgen der möglichen Annahme des Gesetzesentwurfes sind aus den Erfahrungen aus anderen Ländern bekannt. Egal ob drinnen oder draussen – jetzt ist die Zeit der Solidarität. Solidarität mit den kämpfenden Gefangenen in Griechenland! Kapitalismus zerschlagen – internationale Klassensolidarität aufbauen! This entry was posted in General, RHI and tagged Griechenland, RHI on 2014/06/16 by Rote Hilfe Schweiz.